This article was originally written by Brian Fonseca and appeared in The Daily Targum on December 25, 2015. It has been republished with the author’s permission. The day prior to the night before Christmas is a time to go out and do some last-minute holiday shopping as the midnight hour of Dec. 25 quickly approaches. As for the Rutgers men’s basketball team, it was able to give the 3,624 fans who trekked their way to the Louis Brown Athletic Center on the stormy night before Christmas Eve a parting present. 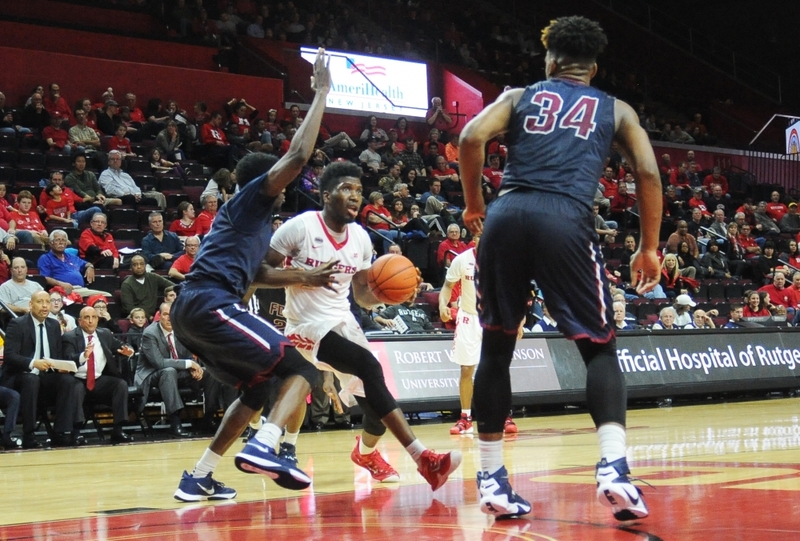 Before leaving for a 2-day holiday break, the Scarlet Knights nabbed a 72-64 win over in-state opponent Fairleigh-Dickinson. With just eight scholarship players available after a string of injuries, head coach Eddie Jordan had limited options off his bench. As a result, rather than looking at how many minutes his players were logging, he made his substitutions based on who gave the Knights (5-7) the best chance to win. Photo by Mike Klejmont | Freshman forward Jonathan Laurent looks forward to returning to Orlando and seeing his family for the first time since he came to Piscataway in August during his two day Christmas break. He and his teammates report back to practice Saturday to prepare for their final non-conference game against UMass-Lowell Monday and their first Big Ten conference game against Indiana at the Louis Brown Athletic Center Dec. 30. If that was the case, Corey Sanders was playing out of his skin. The freshman point guard, who leads the team in average minutes per game with 30.9 per contest, was on the court for 35 of a possible 40 minutes. Sanders dropped a career-high 21 points in the process, pushing his leading points per game average among Big Ten freshmen to 13.5 points. Getting few opportunities to catch his breath during his best performance in a Rutgers shirt, the Lakeland, Florida, native wasn’t able to get much of a break following the win either. Sanders had a flight to catch at 3:45 in the morning — just under six hours after the final horn blew at the Louis Brown Athletic Center. The destination — his home state of Florida. But you won’t see the point guard complaining about his lack of rest. He’s just happy he gets to see his loved ones for the first time since Nov. 15. Sanders’ fellow freshman from Florida, forward Jonathan Laurent, will also be returning to the Sunshine State for Christmas after his own high-motor night against FDU. After dropping 12 points and grabbing six boards while playing in place of foul-troubled sophomore forward D.J. Foreman at the unfamiliar four spot, Laurent also had a flight to board early in the morning to return to his home in Orlando. Playing more than 1,000 miles from home makes seeing family a rare event for Laurent. His family has yet to watch him play for the Knights. They plan on coming up to Piscataway to attend a pair of Big Ten games, but the conference slate doesn’t begin until Dec. 30 against Indiana. Meanwhile, Laurent looks forward to interacting with his family in-person for the first time since he began his first year in college on the Banks. The Christmas break is a prime opportunity for the Knights to catch up on sleep after being a game away from completing their non-conference schedule — and a few days removed from finishing final exams. Sleep can wait, however, as the players look to take advantage of the free time to reconnect with some familiar faces after the grind of the fall semester. Laurent plans on following in the footsteps of his point guard, looking to squeeze out every possible second he has at home before returning to New Jersey. When envisioning his first winter at Rutgers, the Dr. Phillips (Fla.) product expected to escape the typically cold December weather of New Jersey with the heat of a Florida Christmas. Laurent has been pleasantly surprised with his first December in the Garden State, which has seen temperatures reach as high as 70 degrees and spend much of the month hovering around 60. As soon as the Knights take their final steps in their hometowns and head back to school, their minds will move back to basketball and things will be all business. Preparation for their final non-conference game against UMass-Lowell on Monday begins with practice on Saturday and Jordan fully expects his players to be ready. The quick turnaround is sure to be a non-issue for the Knights. The commitment to the sport was embodied by Sanders, who said he will never fully stop thinking about his duties for Rutgers while he enjoys the company of his friends and family back home.